Demand for biophilic design is at an all-time high. It is evident throughout the restaurant landscape with environmentally-conscious restaurateurs and consumers. So, just what is biophilic design? The architectural framework weaves patterns and forms of nature into a built environment. Not only aesthetically pleasing, it’s also becoming a critical method for maintaining health and wellbeing in both urban and suburban areas. With more than 70 percent of the population estimated to reside in cities in the coming decades, according to a study conducted by environmental consulting firm, Terrapin Bright Green, the need for green in indoor spaces is only expected to increase. 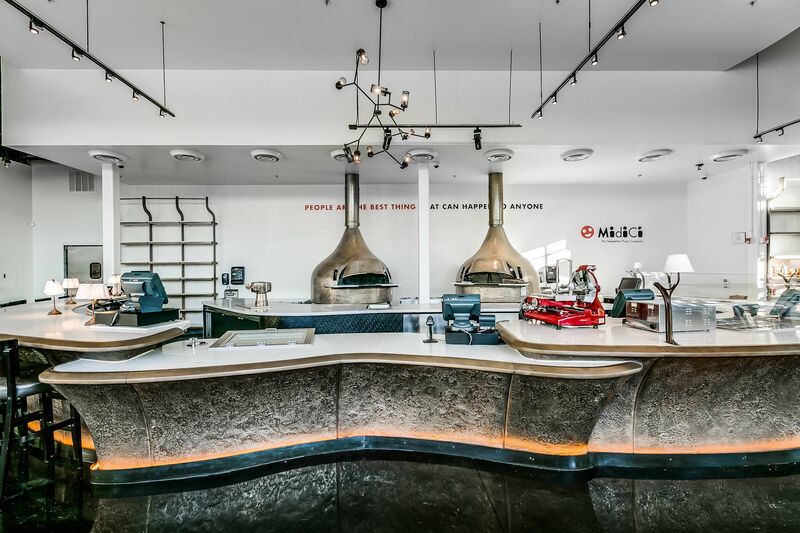 In this MRM Talking With, //3877 co-founders and principals David Shove-Brown and David Tracz discuss biophilic design, their projects such as the latest Midici Pizza location in Nottingham, Maryland and challenges. Use of sustainably-sourced or local materials such a local timber, steel, glass, etc. And, why the name //3877? It is the latitude and longitude of the boutique architectural design firm’s Washington, D.C., base of operations, of course. How do you define biophilic design? To us at //3877, biophilic is that connection between the built environment and nature. It is beyond putting potted plants in the corner; it’s about humans engaging with natural elements visually, physically, and metaphysically. Why do you feel demand for biophilic projects increasing? DSB: Absolutely, these types of projects are increasing in number. The benefits of biophilic design philosophies are endless from the simple visual pleasure to increased oxygen and general serenity. What kind of restaurateur approaches you about incorporating biophilic elements? 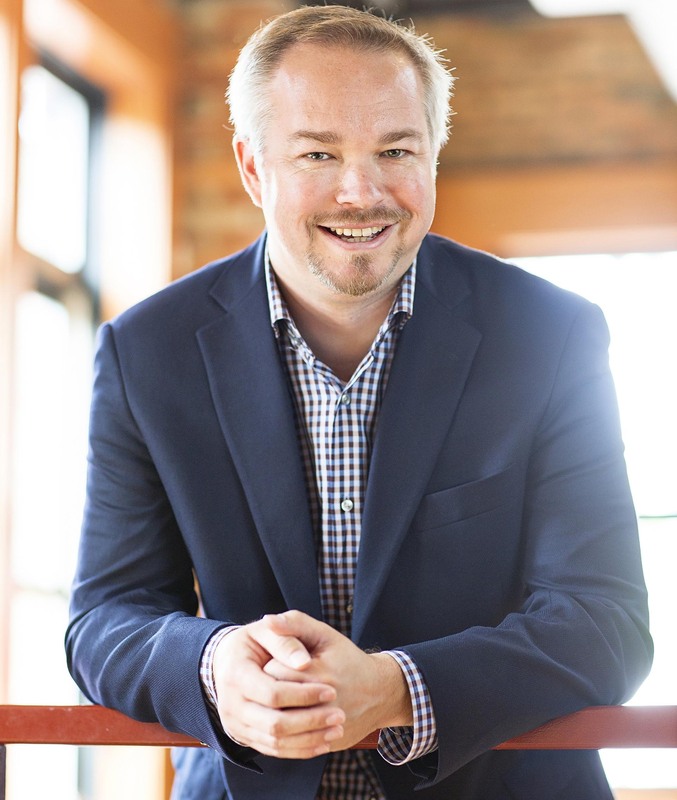 DSB: Not all restauranteurs are ready for the commitment involved with biophilic elements. Owners need to be prepared to spend money for installation and maintenance…unfortunately things like plants get cut from spending quickly because of the hefty costs involved. The right owner, however, sees biophilic design as an integral element to the entire concept rather than an add-on. How do approach a project, using Midici Pizza as an example? DSB: There were multiple layers to creating a biophilic design at Midici. The base building for this restaurant is beautiful, with high ceilings, an outdoor deck, lots of light, and functional garage doors. Through these elements alone, biophilic design was going to be integral. Add in the brand’s push for plants and the large olive tree, and we had a recipe for success. The challenge with a project like Midici is integrating all of the moving parts. How does the base building structure work with a 4’ diameter hole for a tree? How do you allow vertical clearance within the space to open the garage doors when the weather is nice? How does a large tree and other smaller plants allow for circulation of staff and guests? The key to Midici was building the 3D model and understanding all of these moving parts. Even with the best planning, we still mocked-out the tree location and circulation on site – there is even a video of a 2 x 4 acting as wood with the owners and design team acting out staff and guest roles to ensure clearances at pinch points. According to the case study, the 3,650 square-foot space has an open-concept layout that directs customers to an ordering counter, where they move past the food preparation zone. A larger, casual seating area is located in front of the central counter, where guests await their orders. The color palette features dark, natural flooring with light-hued walls with muted gold trim and finishes. Natural tree and herb elements provide an organic feel throughout; Large imbedded olive tree used as center point of tables. 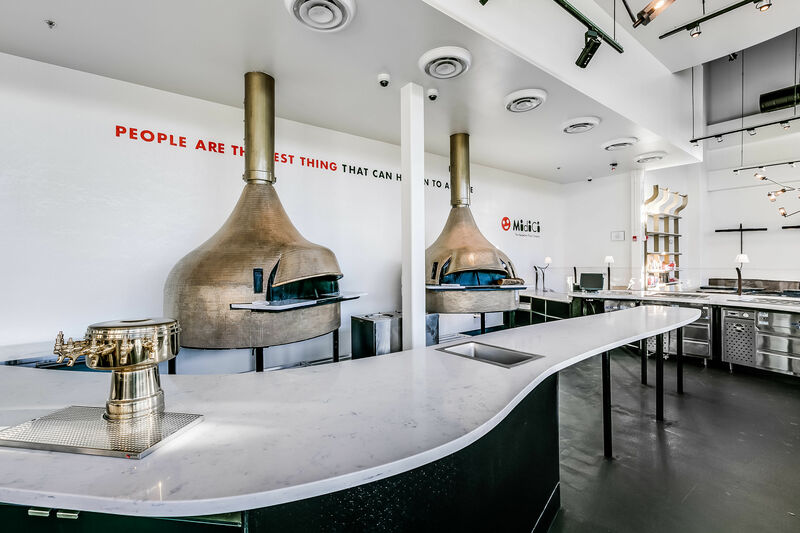 Two large, gold finished wood-fired pizza ovens sit center stage and direct traffic to the space’s curvilinear ordering counter. Defined by a rich wooden border and a textured gold base, the backlit counter space eventually merges into an elevated, bar seating area. Marble surfacing on the counter’s top provides added visual appeal and appears throughout the restaurant on the tops of each the customization stations, where utensils and condiments can be gathered. Bold library lights provide a warm glow for each of these units. 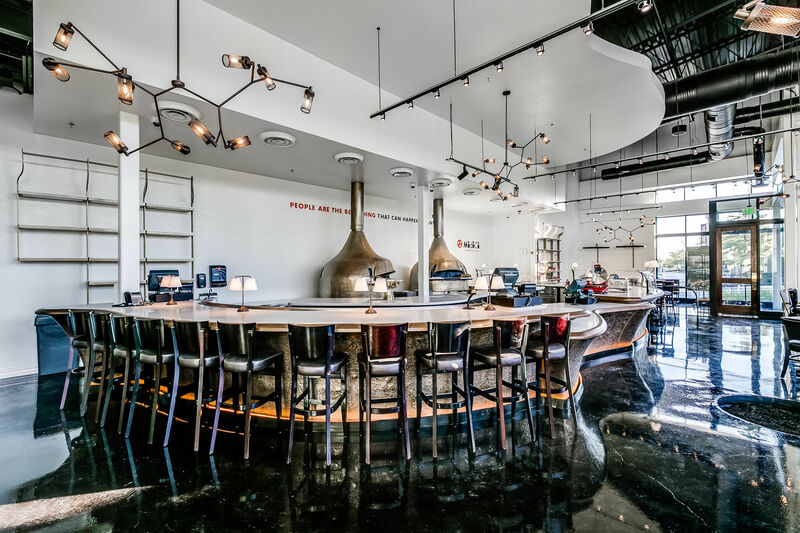 The larger dining area includes lounge and high-top seating offerings to provide a variety of seating options for customers, who can select their preferred seat while they await their entrees. Green elements are prevalent throughout the space, with a live imbedded Olive Tree serving as the focal point of the dining area and a potted-herb arch framing Midici’s in-house signage. Nostalgic of Italian gardens, and reflective of Midici’s menu, the greenery exudes a bright, cheery ambiance. The space’s design is accentuated by ample natural light glowing through the building’s floor-to-ceiling garage doors, creating an atmosphere that’s warm in quality. The restaurant’s high ceilings also play into its ambiance, and are furthered by abstract architectural lighting fixtures. An iridescent black floor reflects the space’s light, amplifying the space’s warm glow. The muted gold color scheme continues into the restaurant’s bathrooms, with doors stained to match. Accessories and fixtures, including door handles, as well as faucets similarly don this opulent style. Why is green so important in indoor spaces? DT: REAL green [not artificial plants] are important on many levels. The visual of plants not only promotes relaxation but can be a wonderful part of the overall restaurant décor. Plants add color and life to just about any style, balancing man-made and natural elements. Plants also provide the scientific benefits of increased oxygen, increased humidity, reduced carbon dioxide and reduced pollution. Fresh air is part of this equation as well; we all desire natural light and fresh air. Window offices are coveted spaces, right? Incorporating operable windows and outdoor seating, we all people the comforted of fresh, not mechanically controlled, air. The whole thing comes down to making an indoor space that feels good. What kind of after care is involved in keeping the spaces lush? DT: This has to be part of the operating budget and planned for from the onset. Plants need to be cared for regularly, which is something that tends to be handled by a third party. In some cases, plants are changed out seasonally; in other cases, plants are watered, fed and tended to so they stay gorgeous. In dealing with a large olive tree, as we did in Midici, the concrete planter was designed to have water and drainage, as well as power, to have grow lights installed in times of lower light. How important is sustainability and using local sources in creating the designs? DT: This is an incredibly important issue, well beyond the “farm to table” craze. People are seeing the adverse effects of climate change daily and anything that can be done to reduce or eliminate the problem is crucial. As designers, we look to the future in our users, clients and guests and see a Gen-Z that is more concerned with being environmentally friendly then tied to a specific brand. We need to prove that we are doing more than providing fresh eggs and are working to heal our injured earth. DSB and DT: Where do we start? We have an amazing team of people in the office that inspire, challenge, lead, create and encourage every hour of every day. We have clients who work with us as teammates, striving to design fabulous spaces for today and the future. We have the privilege of working in incredible places on wonderful buildings and spaces. Did we mention the food we get to eat working on spectacular restaurants? What was your most challenging project and why? DT: Also, where do we start? Our most challenging projects are the ones in which there is a team disconnect; whether the design team is seen as simply a means to an end, or the communication between team members is disjointed. There are definitely times where the whole project can get derailed by urgency. 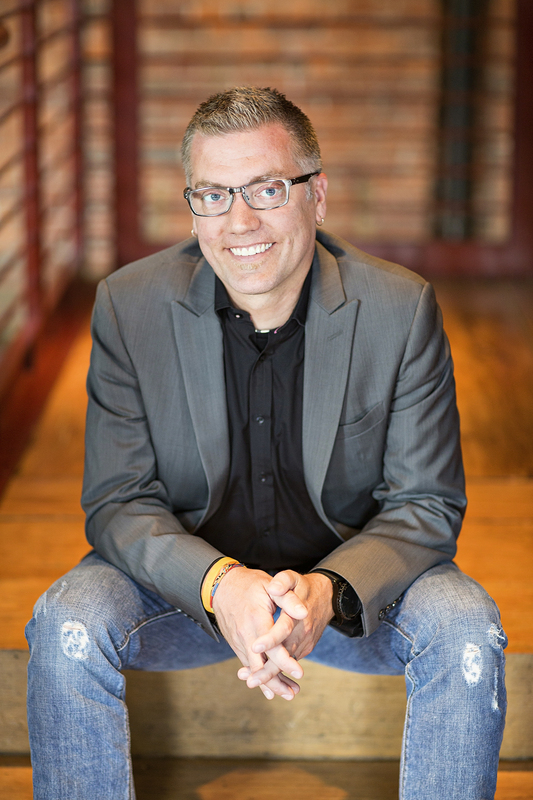 People (Clients, Consultants, whatever), feel like they need to rush to the next thing and that is more efficient rather than stopping and really engaging in the process. Those are the projects that are most challenging where the team doesn’t fully come together.